The Thermaltake Tough power Series is a premium line of PSUs certified to the 80 PLUS Gold standard. Incorporating components of the highest quality, it delivers stable performance and unbeatable efficiency. 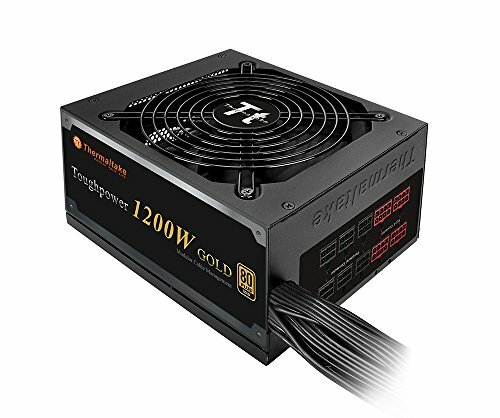 TPD 1200W Gold, which uses a semi-modular design. An ultra-quiet fan delivers silent cooling and a single strong 12V rail flexibly routes the maximum available power to the CPU, enabling peak performance of the computer system. The Tough power 1200W adopts a 135mm cooling fan with intelligent RPM control. This guarantees superior cooling performance and silent operation. The Tough power 1200W saves energy through its high energy efficiency up to 90% and is certified to 80 PLUS Gold. In addition, the Tough power Series is designed to meet the demands of Intel's new Has well processors. Low-profile flat modular cables used in the design enhance airflow as well as improve the thermal performance of the chassis. Flat cables are inherently more flexible, making cable routing easier. High-quality Japanese capacitor produces supreme performance with low impedance characteristics. This delivers stable operation over extended periods of time, as well as excellent reliability. The Tough power 1200W is equipped with an authentic and powerful single +12V rail to ensure a stable and reliable supply to other PC components. 80 PLUS GOLD certified - 90% efficiency under typical load. Compliance with Intel ATX 12V 2.31 & SSI EPS 12V 2.92 standards. 105 Degree / 221 Degree High quality Japanese capacitors.Warranty: 5 Years. Ultra-quiet 135mm fan with smart fan control..Semi modular design with low profile black flat cables.